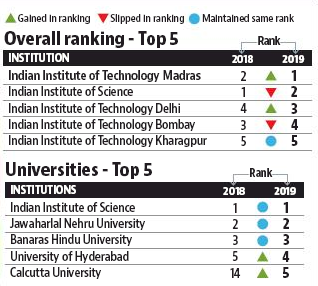 The Indian Institute of Technology-Madras topped the HRD Ministry’s national ranking of higher education institutes followed by IIT-Delhi and IIT-Mumbai, while the Indian Institute of Science, Bangalore, and Miranda House, Delhi, were adjudged best university and college respectively. The fourth edition of the Indian rankings based on the National Institutional Ranking Framework 2019 were announced by President Ram Nath Kovind. IISc Bangalore and IIT-Delhi ranked second and third in the overall rankings of higher educational institutions. Of top 10 institutes, seven are IITs. The Jawaharlal Nehru University and the Banaras Hindu University ranked seventh and 10th respectively. DU’s Miranda House has topped the colleges rankings followed by Hindu College and Presidency College in Chennai. While the prestigious St Stephens college has been ranked at four, the Sri Ram College of Commerce placed at the seventh position. Eight of the top 10 engineering institutions are IITs. Anna University, Chennai, and National Institute of Technology, Tiruchirapalli, have been ranked at nine and 10 in the category. Among management colleges, top six ranks have been retained by the Indian Institutes of Management, led by Bengaluru.